"Why stay with us? you may ask, well Jardines Arenal, La Fortuna's latest budget accommodation offers a clean and friendly place to stay at a very reasonable price, also our excellent location, free breakfast, superb cleanliness, landscape garden, active cattle farm, free internet access and free parking lot makes us different from other hotels. 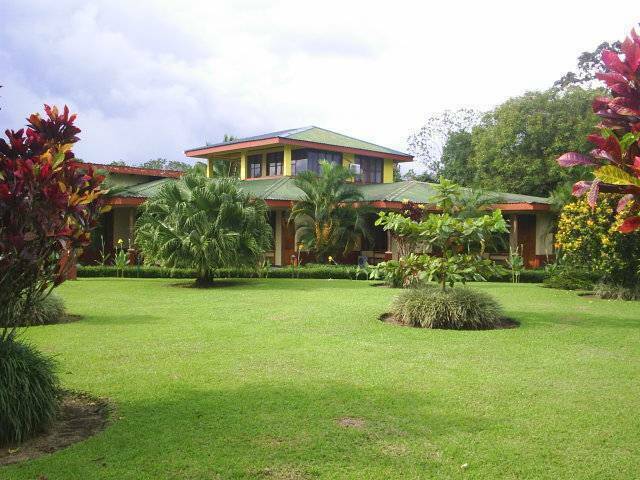 Jardines Arenal Lodge offers visitors a wonderful opportunity to enjoy the natural richness and diversity of Costa Rica. 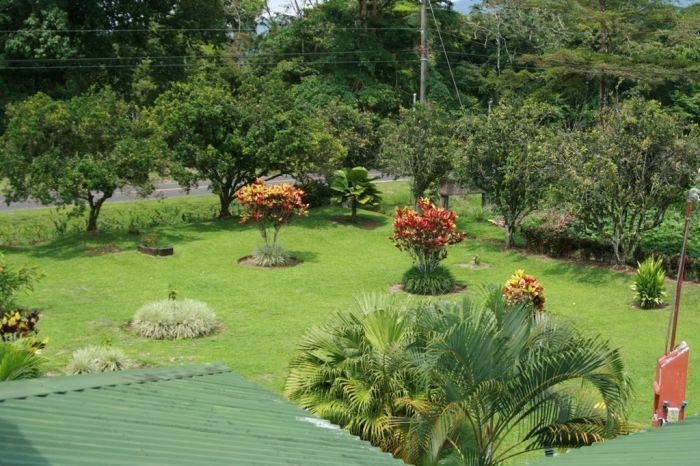 Located in the northern region of Costa Rica, two kilometers east of the town of La Fortuna, our comfortable, relaxing lodge is surrounded by beautiful tropical gardens and provides a majestic view of nearby Arenal Volcano. Our Lodge is also situated in a great location and minutes away from the most important activities like Nationals Parks, Hot Springs, Waterfalls, Canopies, White Water Rafting, canyoning, Waterfall Rappel, Shops, etc. Just ask our staff for ideas! Free transportation to all the activities above mentioned is provided everyday. The hotel has it's own garden, provides amenities, security and comfort for anyone wishing to stay in peaceful, calm surroundings after a exhausting day sightseeing in the most exciting and beautiful town in the world. 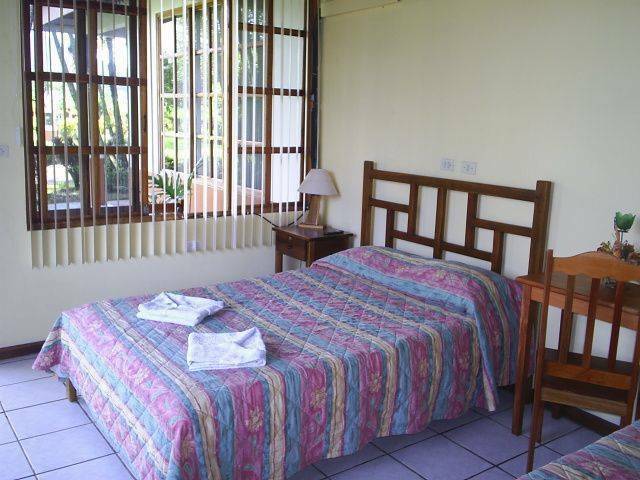 Jardines Arenal have a wide selection of private rooms with 2 - 5 beds, a/c, safe deposit box, hot water, volcano view, radio clock alarm and WiFi for the really price conscious traveler. Great care has been taken in furnishing our rooms to the highest standard with top quality beds and secure storage facilities. Guests can enjoy FREE Internet access in the lobby, FREE WiFi, relax in the lounge or have a drink with friends in our hammocks exclusive area. A free full breakfast, served in the dining room, is included in the price. "Why stay with us? you may ask, well Jardines Arenal, La Fortuna's latest budget accommodation offers a clean and friendly place to stay at a very reasonable price, also our excellent location, free breakfast, superb cleanliness, landscape garden, active cattle farm, internet access and free parking lot makes us different from other hotels. Once you arrive at Jardines Arenal, you will be received by friendly staff who offers an excellent treatment with extensive information and personalized service which we offer to our hosts. Our goal is to offer you as our host a warm, colourful and familiar environment, with tranquillity and simplicity that is reflected by the tico. 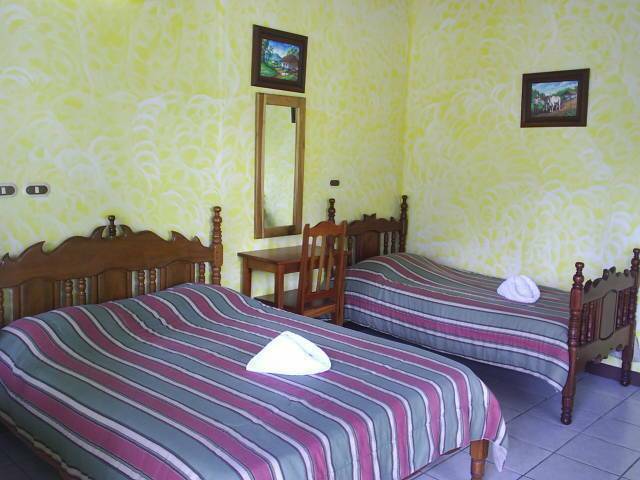 ardines Arenal have a wide selection of private rooms with 2 - 5 beds, a/c, safe deposit box, hot water, volcano view, radio clock alarm and WiFi for the really price conscious traveler. Great care has been taken in furnishing our rooms to the highest standard with top quality beds and secure storage facilities. La Fortuna district is a nice clean a safe place to do unforgettable trip, you can find in very small area an active volcano, rain forest, rivers, lakes, wild life, agriculture, cattle and friendly people. Jardines Arenal Lodge is located in the middle of an active ranch, our main activity for the last 50 year is produce milk to sale it to a cooperative. Since December 31, 2000 we open this lodge and combine both activities. Bus Transportation is inexpensive and very good. Return trip . Ca. 12, Av 7/9 (Atlantico Norte Terminal) 4 hrs. 30 min. Minibuses charge a little more, but all riders must be seated, making the trip more pleasant. Door to door service, 3 hrs. 30 min. we pick up in most places in San Jose. 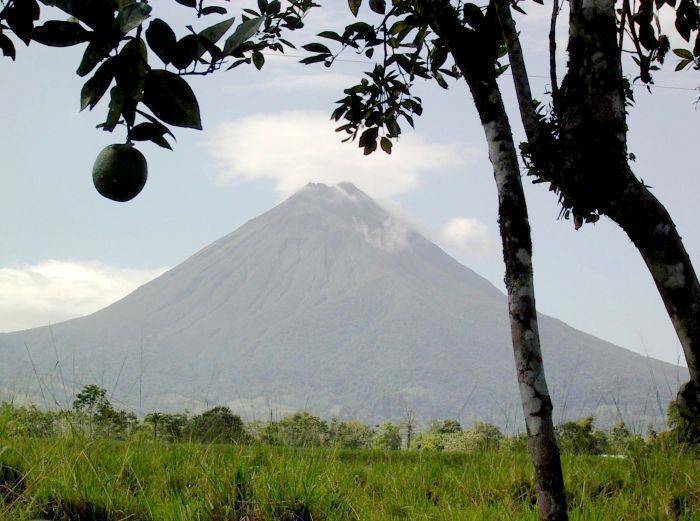 There is one daily flight from San Jose to Arenal Airport. Departure from Pavas International Airport in San Jose to Arenal. 11:40 a. m. Return trip 12:20 p. m. Free pick up from the airport in La Fortuna to the Lodge. 25 minutes. Tourists can drive with valid licenses from their home countries, and passports with valid entry stamps. Seatbelts are required. Driving from San Jose to Arenal takes 2 hrs. 45 min.